To many people, Timbuktu these days sounds nothing more than an allegory for a distant and outlandish place of no particular significance; Even fewer people would have been exposed to the facts that Timbuktu is a real city in the West African nation of Mali; It was the capital of the Empire of Mali in the 14th century, and was one of the most advanced cities in the world during the Dark ages in Europe. Timbuktu is bound to be in the news in coming months however, due to the latest Western aerial bombing project, led by France again. Imperialist powers in pursuit of strategic mineral resources have been responsible for fuelling most of the recent wars that have claimed the lives of millions in Africa, in countries such as the Democratic Republic of Congo, Sudan, the Central African Republic and Somalia. The current French aerial bombing campaign in Mali comes within the context of the renewed scramble for Africa being orchestrated by the neocon elements within the military structures of the former European imperialist overlords who ruled Africa from the late 19th century through to the 1960s. The project is well supported and guided by their neocon godfathers who form the shadow government of the inheritor of the empire, the US. As the brutal aerial bombing of Libya in 2011 demonstrated the renewed French imperial greed for Africa put in to effect by Nicolas Sarkozy, a devout adherent to the neocon ideology. The latest venture in Mali however, is being done against the will of the current socialist leader of France, President Francois Hollande. President Hollande is a decent person who has showed his anti-colonialist credentials: he has signalled a ‘reset’ in French relations with its former colonies in Africa, adopting a new hands-off approach by the old colonial master; He has promised to downsize the 9,000 strong French battalion currently stationed in Africa; Recently in Algeria, he came close to apologising for the French invasion of that country in 1830. 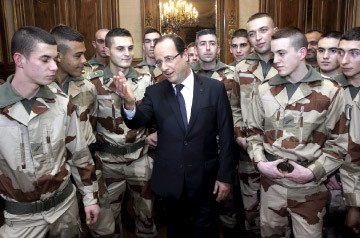 More specifically, Hollande vowed back in October that there would be “no French military boots on the ground” in Mali. Events since January 14 show that the neocons have twisted his arm. The US neocon operated military-industrial complex is currently engaged in numerous military operations in Africa, including in Somalia, Cameroon, the Gulf of Guinea, Botswana, Senegal, South Africa, Morocco, Ghana, Tunisia, Nigeria and Liberia. By the end of 2013 they will have a brigade of over 10,000 troops permanently stationed in Africa, conducting “military training or military-to-military engagement”. There are clear signs that the US neocons are busy spreading its clandestine army all over Africa to achieve the strategic objective of ‘balkanising’ the African continent, as part of their geopolitical master plan. The full-spectrum combatant command United States Africa Command (AFRICOM), headquartered in Stuttgart, Germany with units in England, Italy and in the Horn of Africa, has purportedly been created in 2008 for “strengthening the defence capabilities of African states” and to support US government foreign policy through “military-to-military activities and assistance programmes”. The army officers who received training from Mali, Mauritania, Niger and Chad have captured power through coups in Mauritania, Niger and Mali, and staged an unsuccessful coup in Chad in 2006.The US State Department condemned the coup and called for restoration of democratic rule. So far, it has not taken any action against the military junta. The process began with the toppling of Muammer Gaddafi, and Libya is being used as a springboard for invading other targeted nations, including Mali, Algeria, and Syria with NATO-funded and armed foreign jihadist terrorists. In parallel with the situation in France, the neocon establishment in the US is working overtime to overcome the resistance of Barack Obama who is showing a lack of interest on the Mali project. The story of Mali including its current political problems are typical of the developing world, ravaged by colonialism and being continuously undermined through paid local agents and other corrupt enterprises disguised as ‘aid’ projects. The landlocked West African country of Mali was the core of ancient African empires going back to the fourth century.While most of Mali’s wealth has been plundered, its rich cultural heritage is reflected in its music that is popularised worldwide by stars of the ilk of Salif Keita, known as the ‘Golden Voice of Africa’, a direct descendent of the founder of the Mali empire. Mali was colonised by the French in mid - 19th century and nominal independence was granted in 1960. Since independence, Mali has suffered droughts, rebellions, a coup, and 23 years of military dictatorship, making it one of the poorest countries in the world. Mali experienced rapid economic growth and relative social stability following democratic elections in 1992. Although most of its territory is barren desert country, the fertile Niger River basin in the South and East helps Mali stay self-sufficient in food. Like most post-colonial countries including Sri Lanka, Mali also experienced a century-old separatist struggle in the North of the country:the Tuareg, a Nomadic Pastoral ethnic group whose pre-colonial habitat comprised the current Northern Mali, Northern Niger, Southern Algeria and Southern Libya has been campaigning for their traditional homeland named ‘Azawad state’. The Tuareg Rebellion led by the National Movement for the Liberation of Azawad (MNLA) gathered momentum in 2012. 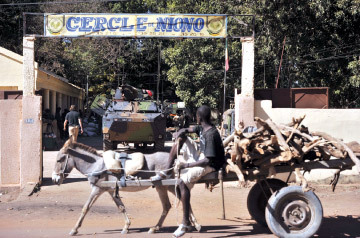 The current, intensified trouble began in March 2012, when President Amadou Toumani Toure’s government was toppled in a military coup d’état staged by a group of middle ranking US-trained army officers led by Captain Amadou Sanogo. Sanogo justified the coup on account of the government’s inability to contain the two month-old Tuareg rebellion in the North of the country:within a month following the coup however, the Tuareg took control of the entire Northern desert region, a territory larger than France. On April 6, 2012, MNLA proclaimed Azawad’s independence from Mali. The MNLA are not Islamists, but were in a loose alliance with the Islamist Ansar Dine and other groups when they defeated the Malian army in the North. Disagreements within the alliance following the victory fuelled internecine battles and the Movement for Oneness and Jihad in West Africa (MOJWA) and Ansar Dine pushed the MNLA out of all the major cities. It was preceded by the same deceitful routine that was used in the cases of the Iraqi and Libyan invasions, of creating a bogus humanitarian urgency and obtaining UN imprimatur in whatever form possible, with a view to liberally interpret it to achieve the strategic objectives. In the case of Mali, the propaganda blitz immediately before the bombing mission was aimed at propagating the myth of a purported Al Qaeda link in Mali. The offensive was justified on the grounds that the Islamist in Mali could create a terrorist state “at the doorstep of France and Europe”. The claim is ridiculous: a good portion of the Tuareg rebels were previously fighting in Libya in support of their benefactor Muammar Gaddafi against Western-backed Al Qaeda jihadist insurgents. 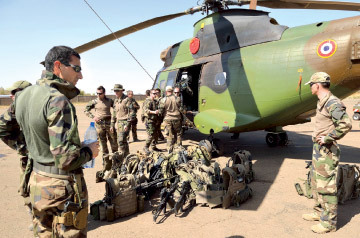 Hundreds of Tuareg mercenaries in Gaddafi’s army came back to Mali early last year, with heavy weaponry, attracting other disaffected Tuareg including some army officers to the MNLA:there is no love lost between the Tuareg and Al Qaeda. Then the story with the UN resolution: back in December 2012, UN Security Council passed resolution 2085 that allowed for the deployment of a 3,000-strong African-led mission to intervene in Mali later this year, if a negotiated solution could not be found: the key conditions in the resolution are that a ‘negotiated solution’ should be given priority and any forces deployed need to be ‘African-led’. After the meeting, France’s UN ambassador Gerard Araud said his country had the “understanding and support” of the 14 other Security Council members. On 16 January, an initial contingent of 550 French soldiers, to be increased to 2,500 within days, backed by French Mirage and Rafale jets were dispatched. The UK provided two C17 cargo planes and Denmark and the US provided further logistics support. Algeria allowed French jets to cross its airspace and closed its 2,000 kilometre long desert border with Mali. The French move to send bombers to Mali does not have a proper UN mandate, and is illegal. Elements within the American and British governments echoed France’s portrayal of Mali as a haven for Islamic fundamentalists allegedly posing an imminent security threat as a launch pad for terrorism in Europe: the head of US AFRICOM, General Carter Ham characterised Mali as the new global base for Al Qaeda. The neocons have been “warning” President Barack Obama that without more aggressive US action Mali could become a haven for extremists akin to Afghanistan. Obama however, is understandably coy about getting entangled in another distant war just as he is attempting to finalise the disastrous Afghanistan involvement: his staff are contesting the advice that the radical Islamic groups that have taken control of parts of Malipose a credible enough threat to US homeland security to warrant a military response. While talking up the threat of Islamic terrorism in Mali, neocon powers are in cahoots with Jihadi militants of similar ideological bent in Libya and Syria: it is clear that the alleged Islamist threat is being inflated by the neocons in France and among its Western allies as a cynical pretext for yet another military campaign. The ‘War on Terror’ serves to cover up the destabilisation of Africa in pursuit of naked imperialist interests in untapped uranium, gold, oil, gas, and rare earth minerals in Northern Mali and the broader West African region. The mythical Al Qaeda is being raised as a ‘spectre’ to justify increased international intervention under the guise of ‘global security’. The world can expect more Western corporate media reports of mysterious Al Qaeda jihadists destabilising poor, starving African countries, requiring the dispatch of the noble NATO forces to ‘save the Dark Continent’. But the world knows.